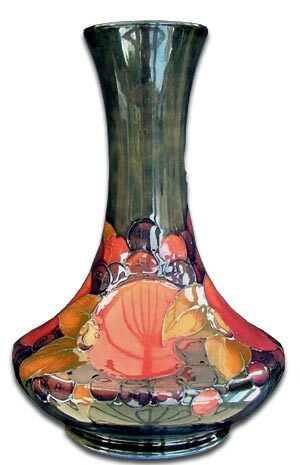 Our Moorcroft Designs Gallery giving you a brief look at some examples of Moorcroft pottery patterns and products. 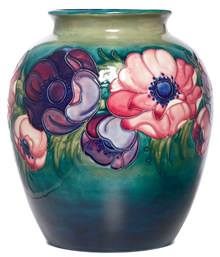 The Moorcroft Designs Gallery includes mainly vases in the most popular designs produced by William Moorcroft and Walter Moorcroft. 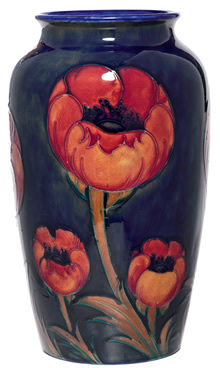 We’ve also included a few of the more modern designs by the artists from the Moorcroft Design Studio. Including Sally tuffin, Rachel Bishop, Philip Gibson, Emma Bossons and Sian Leeper. 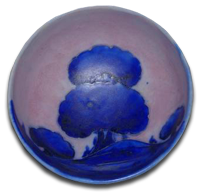 A rare William Moorcroft salt glaze Dawn pattern bowl decorated in typical blue colourway. 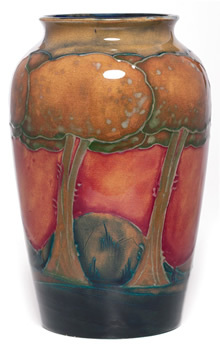 4 inch diameter & 2 inch high with Moorcroft impressed marks to base. 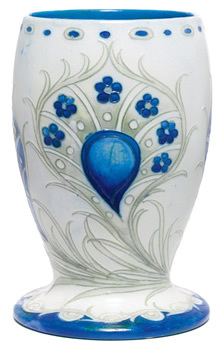 Vase of slender baluster form, finely tube lined and decorated in red, blue and green in the Macintyre Poppy design within forget-me-not borders on a cream ground. 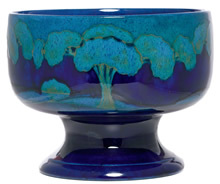 Moorcroft Moonlit Blue Landscape BowlThe Moonlit Blue Landscape design was introduced in 1922.A rare specimen vase was exhibited at the British Empire Exhibition in 1924.The Moonlit Blue has become very popular with serious collectors. The pomegranate design was initially called Merena when it was sold through Liberty & Co. 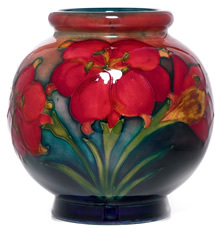 The selection includes a beautiful William Moorcroft vase in his rare Pomegranate design, first produced by William in 1910. 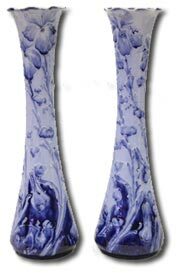 Depicting hand painted pomegranates and berries in rich deep colours upon a mottled cobalt blue ground. 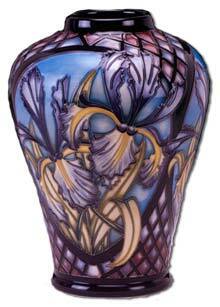 The Siberian Iris design was produced by Sian Leeper. There are several limited editions in this design. Freesia was designed by Walter Moorcroft in 1954. 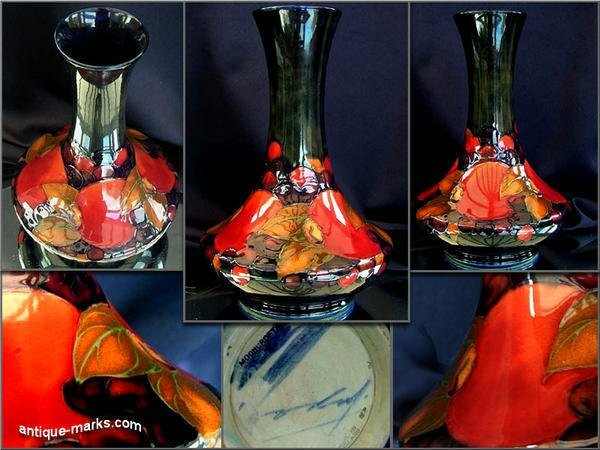 Initially only used on two vases, plus a bowl and a coaster design. The hisbiscus pattern was designed by Walter Moorcroft in 1949. The arrival of pressed flowers from Jamaica inspired Walter. The design was re-drawn in 1960, when buds were removed to balance some some colours. The early pansy design included bands of yellow, mauve and red flowers with pale green foliage. Between 1913 and 1918 the flowers became darker and the ground progressed to the mottled blue seen here and a mottled green.